When the first plant explorers arrived in North America, they were undoubtedly amazed at the wealth of new species they found here. 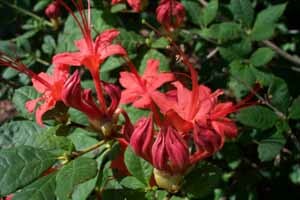 By the 1800's, plant collectors in Europe were already using our native rhododendrons and azaleas and in hybridizing programs to create many new strains including the Ghents and the Iron Clads. 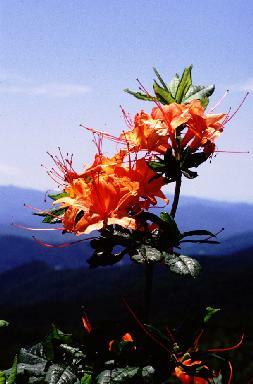 The chance of finding a new rhododendron species today though is very rare, even in remote places like the Himalayas. 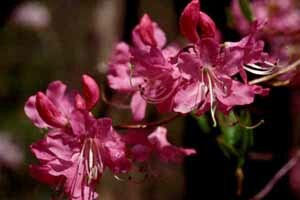 People did find a new azalea species, R. eastmanii, in South Carolina in 1995. However, finding the best forms of known species should be our next quest. We need to preserve the diversity in the wild before it is lost. 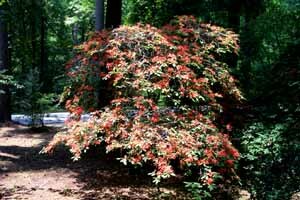 The flame azalea, R. calendulaceum (pictured right), has always been one of the most highly prized of our American natives. 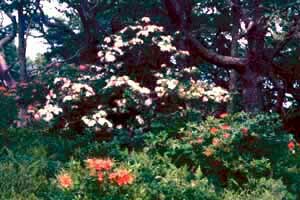 As William Bartram referred to the species when he first encountered it, “This is certainly the most gay and brilliant flowering shrub yet known.“ It is also one of the most variable. The color range in the wild is not just orange or yellow, but comes in a continuum from light lemon yellow through deeper yellow, to gold, orange, orange-red to rich scarlet red. Some flowers have broad contrasting blotches whereas in others the blotch is negligent. All are lovely! 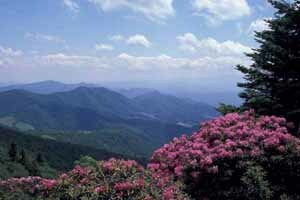 One of the best locations for seeing R. calendulaceum is along the Appalachian Trail in the Roan Highlands at the border of Tennessee and North Carolina. This area was the first stop on our chapter field trip in 2002. A relatively short 30-minute hike from the parking lot at Carver's Gap to just over the crest of Round Bald is an area known as Engine Gap (pictured left). From this point and continuing northeast for several miles is one of the finest and most diverse stands of calendulaceum anywhere in the wild. 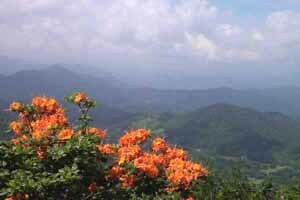 The population shows the full color range for the species and the mountain scenery is truly superb. I am partial to yellow in the landscape and several plants have caught my eye over the years. 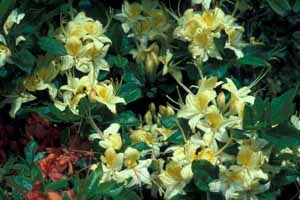 One is a compact, semi-dwarf plant with heavy textured flowers of a clear butter yellow and a gold blotch. We call it 'Roan Buttercup' (pictured below right). There is a nice yellow at Carver's Gap beside the original path of the Appalachian Trail, and near Jane Bald is another excellent tall yellow we call 'Roan Big Bird' (pictured below left). 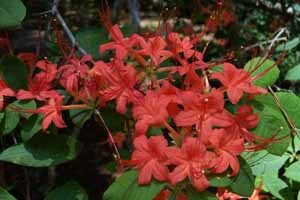 One of my very favorite flame azaleas is on Jane Bald, a plant we call 'Roan Molten Lava' (pictured above). I know part of my fascination is due to its extremely photogenic setting, perched at the edge of a steep slope with those mountain peaks in the distance. 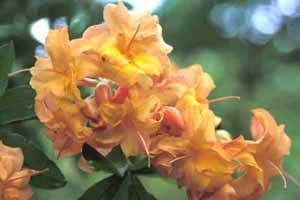 Even so, it is a very fine form with large 2½-inch, ruffled flowers of golden orange that glow like molten lava in the sunshine. I suspect the color of some calendulaceum forms is a function of multiple pigments. I have noticed with certain light yellows and oranges, that the flowers often develop a pink flush either in the bud or soon after they open. This often produces colors that appear pinky apricot to salmon as can be seen in the picture to the right. This tendency seems to be more pronounced in strong sun conditions, too. I have wondered if that pink blush might somehow be related to the fact that calendulaceum is supposed to be an allotetraploid, a plant that developed from a merger of two other species. It carries four sets of chromosomes instead of two, apparently having a full set of genes of the orange R. cumberlandense (bakeri) and a full set from the deep pink R. prinophyllum (roseum). 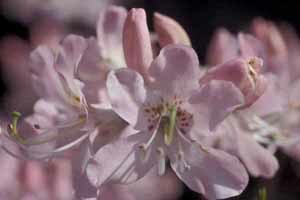 Perhaps that pink flush is from the latter species just reminding us its genes are still around. Other forms of calendulaceum show a similar tendency for the flower color to deepen with age. Instead of a pink flush though, the transition can be very pronounced and sometimes startling. 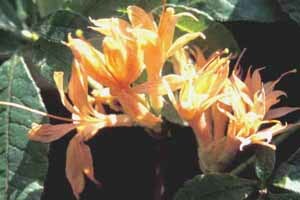 On some plants, flowers open clear yellow but within a day or two change to deep orange or even orange-red. Notice the flowers in the image to the left. Most of them are a golden yellow, but a few of them are are now changing to an orange color. 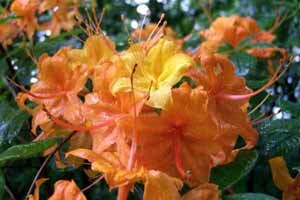 Since I often revisit the same stands of azaleas from year to year, it can be confusing to photograph a lovely yellow calendulaceum one season, only to go back at a later date to find a plant with orange flowers in its place! Some of the largest calendulaceum flowers we have found in the wild are at Hooper Bald, a high ridge off of the Cherohala Skyway, a road that runs from North Carolina into Tennessee just south of the Smokies near Robbinsville, NC. Pictured to the right is a plant we call 'Hooper's Copper'. It has huge flowers that can measure as as much as 3¼ inches across, the largest flowers we have ever seen on this species. Interestingly, the blossoms on this selection open yellow but soon change to a coppery orange as discussed in the previous section. In fact, the photo above and the one to the right were taken of the same plant, but photographed in different years. One plant on the bald we call ‘Hooper Pumpkin’ has 3-inch flowers of Jack-o-lantern orange with a triangular yellow blotch and another has similarly large flowers of a uniform Florida orange color with no blotch. We call that plant 'Hooper Valencia'. We haven't found any clear yellows on Hooper Bald but there are several large flowered gold selections there. Unfortunately, some of the plants are becoming crowded out by encroaching vegetation and may stop blooming in a few years if the young trees create too much shade. This October, I had a chance to hike with two of our Associate Members from the Valley Forge Chapter ARS, Jim Gears and Karel Bernady. On one hike, we went to the top of the spectacular Big Yellow Mountain. In prior years, I had heard people speak of Big Yellow Mountain. This peak is adjacent to Grassy Ridge near Roan but is not quite as high as neighboring mountains. However, the 360-degree views are absolutely incredible. 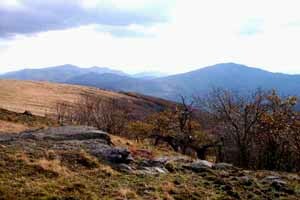 The entire top of the mountain is grassland that turns yellow in the autumn, which can be seen in the image below to the right. That yellow color is likely the source of that mountain's name. 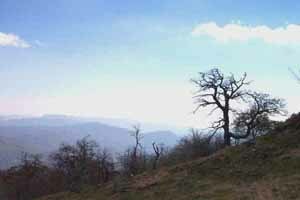 Artisticly gnarled trees grace the steep slopes on the side of the mountian, too (below left). The scenic trail is about a 5 mile round trip hike from the Appalachian Trail but having been there once, Big Yellow is on my "must do" list for every year from now on. Jim and Karel have identified some excellent forms of calendulaceum on Big Yellow. They call one plant 'Jacob's Coat' because the flowers bloom in a mixture of orange to yellow in the same truss. Another superior form they call 'Big Red' because it is one of the largest plants there and has large, deep red flowers. Good red calendulaceum selections are quite scarce in the wild. The SAHC (Southern Appalachian Highlands Conservancy) was able to purchase the top of Big Yellow Mountain recently. 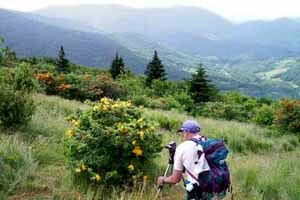 Established in 1974, the SAHC is a non-profit organization that works in cooperation with the National Forest Service to acquire land in the Roan Highlands so they can forever protect those mountains from reckless development. Membership is only $35 per year ($50 family) and the money goes to a great cause. 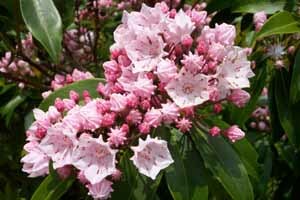 Of course, the June display of R. catawbiense in the Roan Highlands, especially on Grassy Ridge, is another “must see” since the mountaintop turns pink when the rhododendrons bloom. As I look out on those distant mountains, I wonder how many other wonderful selections of our native species are hiding in remote sites. Yes, there is much for modern plant explorers to do. We have found some very rare double forms of our native azalea species in the wild too, such as a superb double calendulaceum (pictured leftt) that we discovered near Wayah Bald in North Carolina. We refer to that plant as ‘Wayah Double‘ but it surely deserves a better name. The flowers are 2 inches wide, hose in hose, with 10 petals but no stamens. The color is a light apricot orange brushed with red on the buds. It has a broad gold blotch that extends into three of the five petals on each whorl in the corolla. 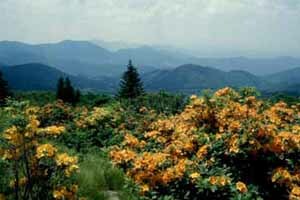 We have seen other double forms of calendulaceum near Wayah Bald, and people have told us of more double flame azaleas near Mt. Pisgah, NC. George McLellan found a pure white double viscosum in Virginia this year (below right). 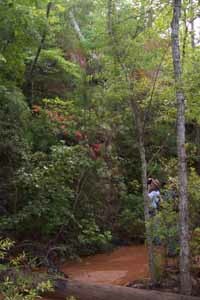 In 2003 we found a double, petaloid cumberlandense in Georgia near Slaughter Mountain (below left). It reminded me of a small 'Koromo Shikibu' but with ten narrow petals of light orange. R. arborescens is surely one of our finest native species. 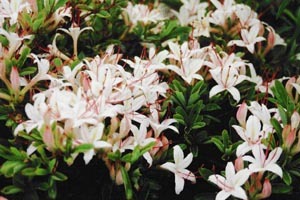 It typically blooms in June with white flowers, distinctive red stamens, and a delightful fragrance, the most strongly scented of our native azaleas. The flowers of aborescens are not as large as calendulaceum but we have found selections that do exceed 2 inches in diameter. 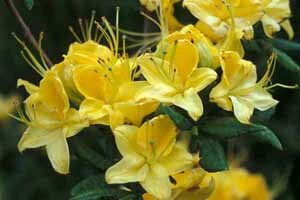 Clarence Towe has introduced a large flowered arborescens selection with a yellow blotch and it has a compact plant habit. He calls it ‘White Lightning’. 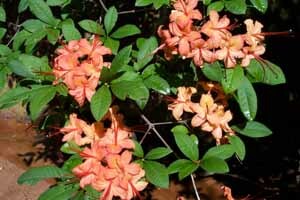 According to native azalea expert Dr. Kathleen Kron, arborescens is not supposed to have a blotch so that plant probably has some other native azalea genes in its background somewhere. Regardless, it looks and smells like arborescens and makes a great landscape plant whether it is a pure species or not. This year I was very impressed with some late flowering forms of arborescens we saw in full bloom at Callaway Gardens in mid July. The locals call this plant the Georgia Azalea, or R. arborescens v. georgiana. Our taxonomy expert Don Voss informs me that name is "illegitimate" since the plant’s existence was not formally recorded. Even so, I must have one! 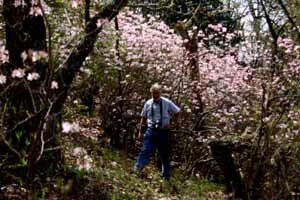 Mike Creel, an extension agent from South Carolina who co-discovered R. eastmanii, tells me he has a form of arborescens that blooms for him in early May. 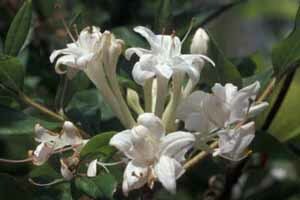 The thought of having different forms of arborescens providing that intoxicating fragrance from early spring throughout the summer months is very exciting. We hope to have some seeds of these selections in our exchange. 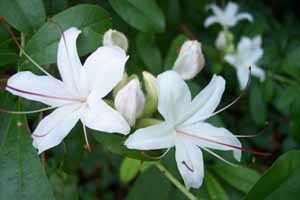 Another wonderful but highly under utilized native azalea species is R. vaseyi. As a species, vaseyi has a very small natural distribution confined to elevations of 3000 to 5000 ft. in just four counties of North Carolina. Even though it comes from those upper elevations, it seems surprisingly well adapted to our warmer gardens. Most vaseyi plants are raised from seed but there are surely many other distinctive forms that we should be growing from cuttings. We must identify them first. 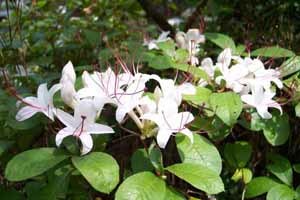 The only form commonly propagated by cuttings is R. vaseyi ‘White Find’. It has snow-white flowers and a green blotch. After the ASA Convention in 2003, George McLellan and I decided to hike to the top Pilot Mountain (pictured right) in North Carolina near Mt. Pisgah to see the vaseyi. It was early May. We parked at the end of a Forest Service road and ascended the trail to the 5000 ft. summit. 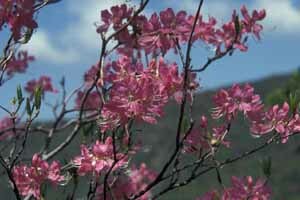 As we hiked, the vaseyi became more and more abundant until it seemed as though we were walking through a pink cloud. The plants were huge, towering overhead on both sides of the trail and there were wildflowers growing everywhere. The views of the mountains in the distance were fantastic too. We saw much variation in the flower forms of vaseyi as we progressed along the trail. Petal width could be narrow or broad and flowers could be star shaped with pointed petals or very round with broad petals. Some flowers were rose pink whereas others were near white to blush and some had white centers giving a bicolor effect. On some forms, the blotch was absent whereas in others we saw prominent spotting in shades of green, brown, or red. We even found forms with differing numbers of petals. One had only 3 or 4 petals whereas another had six petals. 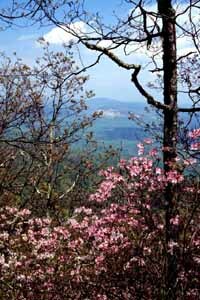 Most of the flowers on Pilot Mountain were in the lighter pink shades but some forms of vaseyi can be very deep pink to almost red. Along the Blue Ridge Parkway south of Asheville is an excellent place to see the full color range of vasei without ever getting out of the car. 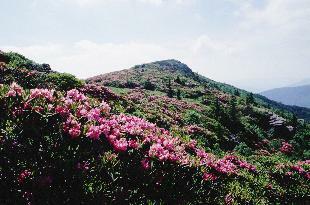 Near the parking area at Graveyard Fields Overlook is one of the deepest deep pink forms of the species, a plant many people refer to as the “red” vaseyi. Most of the time though, they just call it “419.2” which identifies its milepost on the Parkway. An area with the greatest color variation we have seen is near a road south of the Parkway on the side of a steep slope in Transylvania County, NC. We saw near white flowers and blush shades to clear rose pinks and some of the deepest pinks I have ever observed in the species. While driving slowly admiring the display, simultaneously George McLellan and I spied something that looked genuinely red! It was up a steep embankment so we stopped the car, got out, and decided to scale a rock cliff to see the plant up close. It was indeed a very deep color, a “red” vaseyi! We both agreed that this was as close to red as any we had ever seen. In our estimation, it was much better than “419.2“. Although we call this plant our “red" vaseyi, I guess we are all taking liberties with that color designation. 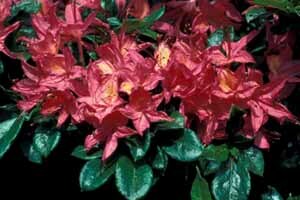 Certainly the intensity cannot match the red of a rhododendron like ‘Taurus‘ but the deep rose pink color of the plant we found was at least as dark as the rhododendron ‘Gigi’ when it begins to fade. That is a very deep color for vaseyi but I wonder what other, even darker forms might be hiding out there in the mountains. In any case, we have started seedlings of our "red" vaseyi to give away to attendees at the 2006 Convention. 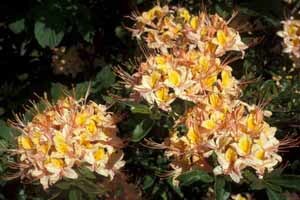 No discussion of rare native azaleas is complete without referencing the wonderful hybrid swarm on Gregory Bald. Since 1995, I have hiked that mountain nine times. The trail to the top of the Bald is rather strenuous, and takes approximately 3 to 4 hours one way. A slightly shorter trail via Parsons Branch Road that our chapter took on its field trip in 2002 remains closed due to a number of washed out areas caused by recent flooding. 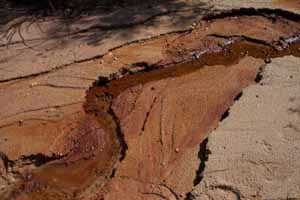 Hurricane Ivan and several other storms this year did additional damage and many local roads remain closed. 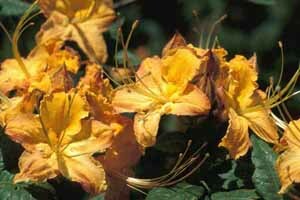 Gregory Bald is like one enormous flower show and I have been trying to decide which of the many thousands of gorgeous azaleas up there are the very best forms. 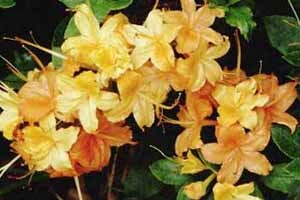 Almost every shade I have seen in a deciduous azalea is represented. Admittedly, the majority of the plants are in the orange to red range because R. cumberlandense is the predominant species. 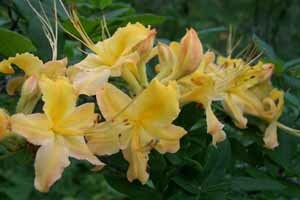 However, arborescens, viscosum, and calendulaceum have apparently hybridized with cumberlandense to produce azaleas in every shade from white, to cream, pale pink, rose, deep pink, lavender, purple, fuchsia, cherry, scarlet, coral, salmon, gold, and yellow. The very first plant I saw when I made my initial hike to Gregory Bald in 1995 will probably still make my top ten list. We call it ‘Gregory Blush’. 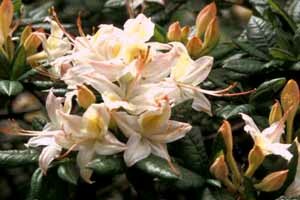 Its 2¼-inch white flowers have a pink blush and a broad yellow flare and it is also fragrant, probably from arborescens. The foliage is dark green and the plant habit is broad and full. Unfortunately, an overhanging branch of an oak tree broke off a few years ago and smashed this plant but it should recover in time. 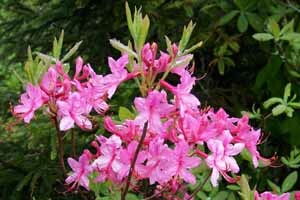 Of the many pink azaleas on the bald, my favorite is a later blooming selection we call ’Gregory Candy Stripe’. We gave it the name because we usually saw it in the bud stage before it had completely opened. The buds are deep pink striped with greenish white before they open and reminded us of candy canes. 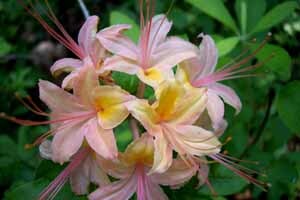 When the flowers do finally open, they are a 2 inches across, fragrant, a clear soft pink that deepens with age and a light yellow blotch. At that point, they show no signs of the stripes anymore so I worry that name we are using is inappropriate. We use it anyway though. An additional plus for this plant is its attractive blue-green foliage. The best red on the bald we call ‘Gregory Christmas Red’. Its flowers are deep, poinsettia red and its foliage is dark, glossy green reminiscent of holly. 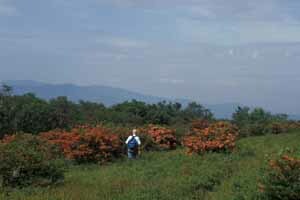 It is one of the largest plants on the bald and I suspect it is the likely parent of many other excellent reds growing up there. Another favorite plant that will make my top ten is ’Gregory Fuchsia’, a deep fuchsia pink with a prominent yellow blotch. 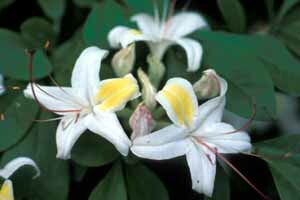 The flowers are slightly larger than average, about 2¼ inches in diameter, and the foliage is dark green and glossy. One that may make my top ten is ‘Gregory Melon Balls’. It has large ball shaped trusses composed of many small 1½-inch flowers that are cantaloupe color with a gold blotch. Names can be frustrating though. The flowers of this plant can be flushed with pink at times... a lovely shade but no longer melon color. In early June of this year, I headed out to the Monongahela National Forest in West Virginia to investigate the prinophyllum (roseum) on Dolly Sods pictured to the right, and nearby Spruce Knob. I had seen this are in bloom several years before and knew I had to return. 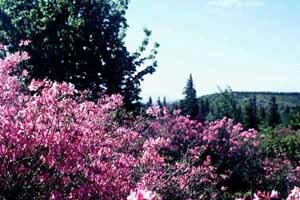 In places, the top of the mountain turns deep pink when the azaleas are in bloom and the strong cinnamon spice fragrance that pervades the air is just wonderful. Due to a rather warm April and May, the spring season in 2004 was ahead of schedule by at least a week or more. Although the azalea flowers on Dolly Sods were just beginning to go by, the blooms on Spuce Knob were excellent. At 4461 feet, Spruce Knob is the highest point in the state, several hundred feet higher than Dolly Sods, so the bloom times are a few days later up there. The region is yet another lovely natural garden. 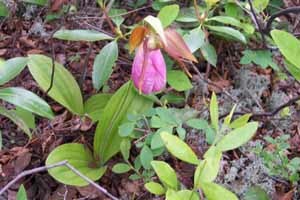 There are many lovely wildflowers growing among the rocks, especially the wild bleeding heart, Dicentra eximia, and occasional pink lady slipper orchids, Cypripedium acaule. In the natural bogs on the top of Dolly Sods, the wild cranberry plants were just opening their tiny white flowers too and as the season progresses, the Mountain Laurel, Kalmia latifolia, begins to open too. We must organize a chapter field trip to the area very soon. 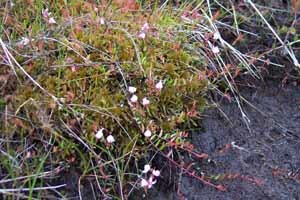 One of the last species to bloom each year is R. prunifolium (pictured below). Like vaseyi, it also has narrow natural distribution, primarily in just a few locations in southern Georgia. Bloom dates do vary significantly. Some plants in Margaret White’s garden bloom in late June to early July while others are later. I have a very late blooming form raised from our chapter seed exchange that doesn’t start until mid August or September, and may even linger into November. The flowers are usually orange-red but that can vary too. In mid July this summer, several of us traveled to Georgia specifically to observe the prunifolium. Our first stop was Callaway Gardens where this species is now that resort’s signature plant. There are natural stands at Callaway but most plants we saw were probably seedlings set out by the late Fred Galle many years ago. I was amazed at the diversity. We found color forms that ranged from light salmon through coral to deepest red. There was diversity in flower size and shape, plant habit, and season of bloom as well. 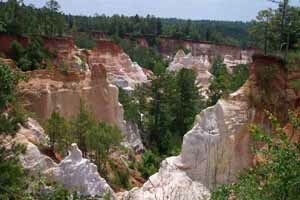 The second stop on our trip was Providence Canyon, which is southwest of Atlanta on the Alabama border near the town of Lumpkin, GA. The canyon is an amazing place. I had heard of the prunifolium there but was taken completely by surprise when I encountered the colorful geology in the canyon. 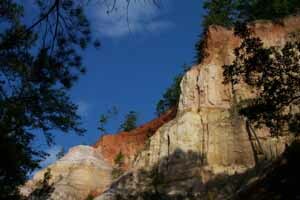 It reminded me of the rustic canyons in our American southwest although on a smaller scale. Unlike the Grand Canyon, Providence Canyon is not the result of millions of years of erosion but is a recent development on the scale of just one hundred years. Natural erosion that began from poor farming practices has created in a very short time a striking canyon with tall mesas and spires, exposing strata of all shades and rustic colors including white, brown, gray, orange, and red depending upon the soil that has been washed away. In the bottom of the canyon there are natural stands of prunifolium, R. minus, Kalmia, and wildflowers too. I thought to myself, one doesn't find rhododendrons in the Grand Canyon! The base of the canyon floor is a wide bed of sand with usually a trickle of water cutting some free form artistic patterns in the various colored patches of sand. Just slightly up the bank, the native R. prunifolium has become established where its fibrous root system seems to keep the soil from eroding any further. We saw many excellent deep reds, corals, and light salmons too. 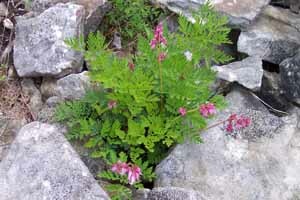 We found a few plants that were pink to rose and we wondered if centuries back the native prunifolium might have hybridized with viscosum or perhaps that Georgia arborescens. None of the flowers were fragrant and we saw no sign of other species nearby. 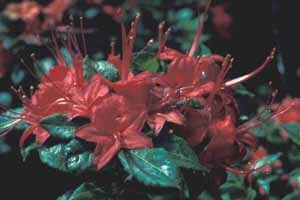 However, we must remember that our native azaleas have survived continental drift and the onslaught of ice ages so who can tell what the scene looked like eons ago. What we see in the wild today is just a brief snapshot in time. It is a very pretty snapshot, though. I hope you agree! 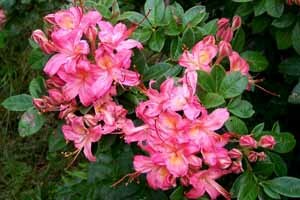 There is something very special about our native rhododendrons and azaleas. These lovely wildflowers have been growing relatively undisturbed for millions of years and I have often wondered if their longevity has helped them lay claim to some of the most scenic natural landscapes in our eastern region as well. In any case, these senior citizens of our botanical community deserve our admiration and respect. Their existence has become threatened in recent years, so please become a steward of these special plants and the special places in which they grow. We must preserve this exquisite beauty for all those who come after us.